I've installed Windows 10 EFI with this Tutorial and it worked fine. But when switching from Windows to OSX using the Bootcamp "Boot to OSX..." it just rebooted into Windows again. Then I unplugged the Windows drive and it booted into OSX, but now if I choose "Windows" from System Preferences->Startup Disk it just reboots to OSX. Is the only way of switching OS in this configuration by using a helper card and pressing alt on boot? I have installed it on 2 separate drives. Windows being in EFI mode, and during the installation I did not use any Boot Camp crap, but I had to leave only 1 empty drive for Windows 10 install and boot from Windows 10 DVD in EFI mode. Then I created the Windows partition from scratch and installed Windows. Download the bootcamp drivers from this link. I did update Windows and installed Boot Camp 6 drivers by running msiexec /i BootCamp64.msi from Administrative CMD window, which is located in Boot Camp\Drivers\Apple directory. Then I connected all the other drives. I have migrated my internal Windows drive to Sonnet Tempo SSD Pro Plus SATA III PCI Express Card. Unfortunately, due to the fact the drives on this card are recognized as external, I guess Boot Runner does not populate an option to boot directly from this drive. As a workaround though I can select the SSD as a boot drive from the Boot Camp manager in my internal Windows drive which works like a charm. i pretty much have the exact same problem with similar configuration. Windows 10 is working fine but "set startup disk" in system preferences seams to not work… In System Preferences under startup disk it shows up my windows 10 folder correctly but it doesn't work when selected and restart – it boots just in Mac OS again. when i boot with holding option(alt) (Mac startup manager) to select the startup disk it shows up "EFI Boot" instead of "Windows" but works actually fine when boot into "EFI Boot" (which is my Win10 install). 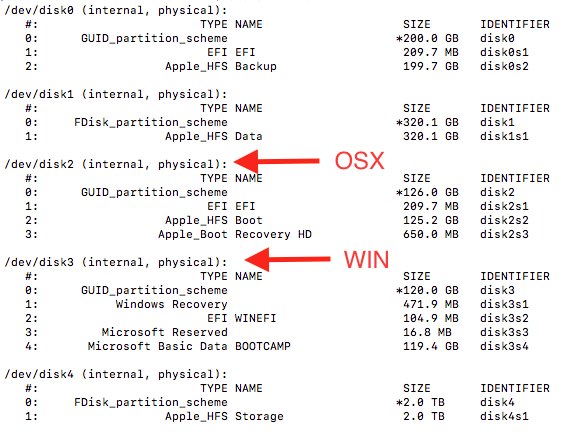 My guess is (when you look at diskutil list) that the EFI Partition should be in position 1 instead 2 (should be disk3s1 instead of disk3s2) to work correctly – Windows Recovery is set on disk3s1 falsely. Not the answer you're looking for? Browse other questions tagged hard-drive bootcamp boot ssd efi .